Delcam has dramatically reduced the price of the entry-level version of its ArtCAM CADCAM software for engraving and woodworking, ArtCAM Express, to US$149, £99 or 125 Euros. The software is believed to be the easiest to learn and the fastest to use engraving and routing software currently available. For full details on ArtCAM Express and to download a trial version, please go to www.artcamexpress.com. 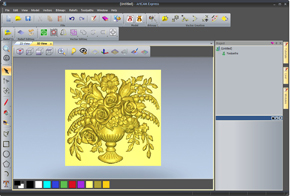 ArtCAM Express offers 2D drawing, and 2D and standard 3D machining functions, and so provides an ideal introduction to computer-based manufacturing for companies in the engraving, woodworking and signmaking industries. A range of modules are available to add extra functionality as the user develops his skills and wishes to take on more complex projects. The software is available in 32-bit and 64-bit versions so that users with the more powerful hardware can work with larger, memory-intensive files. To help visualise the design, it can be rendered in numerous materials, including all the most common metals and different types of wood, such as mahogany or maple, complete with wood-grain direction. If the final design requires external approval from the client, it can be emailed as a rotatable 3D PDF.